Deck boats aren’t new but they usually start at around 6.2m and grow in increments up around 9m. 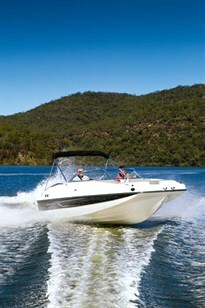 This Bayliner 190 Deck Boat is a smaller 5.6m offering with terrific appeal and a great, big heart. Manufactured by one of the giants of our industry, the mighty Brunswick Corporation, it’s hard to believe that a unit of this capacity can be towed by most six-cylinder family tow vehicles. Even more surprising is the efficiency of the hull when teamed up with a 150hp Mercury outboard-motor. 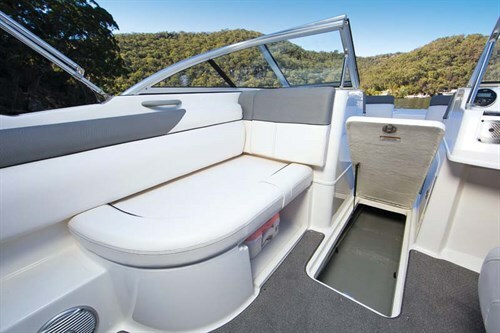 The Bayliner 190 Deck Boat has terrific family appeal with an enormous amount of comfortable seating, both in the cockpit and bow. This space is created by the near-on-maximum towable beam of 2.46m, coupled with a very sensible design. The square nose can easily accommodate four seated adults, but the appeal doesn’t stop there. There’s tons of storage under the seat cushions and a walkthrough to the bow that houses a folding stainless steel telescopic ladder. This is clever for boarding from beaches and river banks – exactly the habitat this fun-filled craft deserves. There is another pair of compartments in the bow where you can keep anchors, accessories or sandy shoes – better than in the boat. The cockpit is huge for a 5.6m boat and the layout is very sociable, so you can entertain without sitting on top of each other. The driver cops an individual bolster-style swivel bucket, and the passengers have a lounge running along the port side that is comfy for two adults or cosy for three. The marine vinyl upholstery is thickly padded and well-trimmed – quite luxurious without being pretentious. There are a few surprises in store when you start looking in hatches and under seats. The first is the volume of storage and the second is the removable cooler under the driver’s console. The cooler concept is okay but there is nothing to retain it and you have to lift it out over a lip for access, so I personally think this is a better spot for safety gear or other accessories. There’s also a moulded icebox under the rear step and another in the transom coaming for refreshments. The next surprise is the Porta Potti mounted under the passenger seat, but use your own imagination on how to utilise this. The floor has clip-in marine carpet and there is a large ski locker as well. The whole boat is very sensibly configured and will be a breeze to keep clean and tidy. The best way to describe the helm is "understated". Minimalistic in its bling it is still well-appointed and ergonomically pleasing. There is plenty of room to park long legs and a seat adjuster for the vertically challenged. 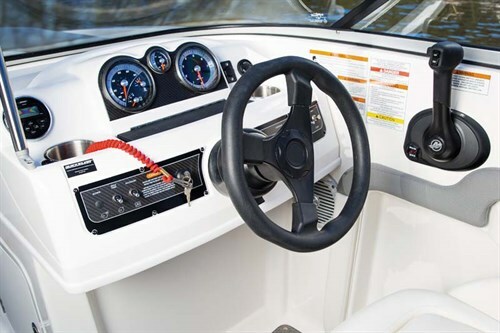 The SmartCraft gauges are easy to read and beside them is the trim gauge, remote for the Jensen 120W six-speaker sound system with MP3 and iPod inputs, 12V outlet, two can holders and a handy little fliptop glove box for your mobile phones and keys. I will concede that my first impression of the Bayliner 190 Deck Boat was that it would be under-powered but boy, was I wrong. I keenly approached the dash and marvelled at the feel, the size and the space before jumping into a comfy bolster seat and planting the throttle. I had to do a double take on the instruments as we quickly rocketed to a top speed of 43.2kts. Yep, that’s 50mph on the old scale, and the defining point of a sportsboat. Bayliner representative Todd Kay and publicist Dominic Wiseman saw my surprise. It must have been plastered all over my face, and they both simply replied with confident grins. There’s much more to this boat than immediately meets the eye. The Yanks and the Europeans have been working on new concepts in hull design for many years, breaking down traditional beliefs that a boat needs a very deep-vee for a soft, predictable ride. And the results are obvious in the Bayliner 190. I flung it into some steep turns to see if I could slow the engine but again, it just kept on gripping and powering through. We ran up quite a wake by continually circling in steep turns, but the hull quietly and predictably went about its task without any bad habits. I was gobsmacked with the performance of the Mercury 150hp olutboard motor and I can only imagine the exhilaration it would achieve with its rated hull maximum of 175hp. The dealer had optioned an 18in Enertia stainless steel three-bladed propeller as an upgrade to the standard 19in aluminium prop. The acceleration and top speed that resulted was excellent and I wouldn’t change it for any standard fitout. However, if you want to carry a boatload full of people and still hang a skier or tube out the back, then I think a changeover prop may be in order. I cannot think of another boat in the size and price range that provides as much internal facility and overall ability as the Bayliner 190 Deck Boat. The package has tremendous lift from the soft riding 17° deadrise and a wonderful turning ability that just grips and grips through turns. She’s a very stable platform at rest and doesn’t falter with moving weight at speed. Sure, the internal trim may not be quite as flash as some imported competitors but there’s also beauty in its simplicity – the thought that has gone into mouldings, platforms and storage is really impressive. There’s a full list of options, including a fishing pack, available through any of the 15 dealers throughout Australia, so this Bayliner 190 package represents great overall value in a dayboat with the lot. Jon us for a "playdate" on Sydney Harbour with two of Bayliner's latest: the 175 and Bayliner 185.